We now offer embroidery. 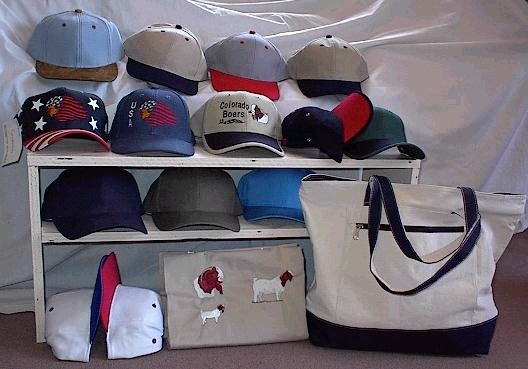 We can embroidery caps, shirts, (denium, T's) and totes. If you are lookingfor something else, let me know. I have many sources, I can get products from. We have some Boer Goat designs. More will be coming in the future. Also, can embroidery, dogs, horses, trucks, and many other things. I have some designs. If I do not have the design you are looking for, I will try to get it, if you want some things embroideried. Prices for caps is $15.00. 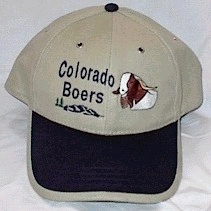 I can embroidery the 2 smaller Boers on caps with lettering. There may be a small extra charge for lettering set up, if only ordering one or two caps. The two larger Boers designs can be put on shirts, and totes, with or with lettering. Denium shirts, with front embroidery, start at $22, depending on amount of embroidery. T shirts (front embroidery) start at $15, depending on amount of embroidery, color, size, and T shirt. We can ship your order. I do not have, like some web sites, the "add to shopping cart," but if you let me know what you want, we can correspond by email, or phone. 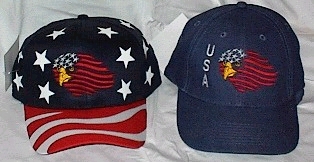 Other style caps may be available. Tote bag-----prices start at $16, depending on amount of embroidery. 19" L X 14" H X 5.5" W. 12 oz canvas, gusset bottom. Zippered main compartment, zippered front pocket. Embroidery on side without pocket. Available in natural/navy, and natural/dr. green.